It’s Sunday, which in my house means pizza day. “What?” you might be thinking? 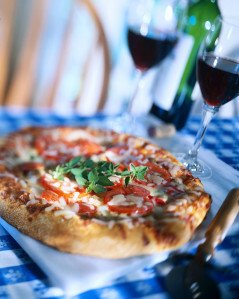 Isn’t pizza loaded with fat, calories and everything yummy but bad for us? It sure could be, but not always. According to the 2010 Dietary Guidelines for Americans, pizza is in the top 5 sources of calories consumed by Americans ages 2 and older. The most popular pizza topping is pepperoni, which as far as I’m concerned is a nutrient-poor choice. Yet look at any pizza menu and you’ll see a bunch of different toppings – some healthier than others. And if you make it yourself, the possibilities really are endless. I started making pizza for myself when I was living on my own for the first time and honestly did not know how to cook vegetables. I was living on a tight budget, so I didn’t want to spend too much time experimenting and throwing away expensive fresh produce. So I figured – how wrong could things go if I just put veggies on a pizza? I even made my own whole-wheat dough (thanks to a long-since-lost Cooking Light recipe), but later found that Trader Joe’s has delicious, inexpensive doughs in whole wheat, plain and herb varieties, saving me a lot of time and effort. Mushroom medley – go beyond boring button…top with cremini, shiitake, enoki and oyster mushrooms. Goes well with almost any kind of cheese, or none at all! Thai pizza – more calorie-dense but sooooo tasty! And my most requested dish. I make my own peanut sauce (another Cooking Light cookbook recipe) to use as the base, then top with shredded carrots, sliced red bell peppers, bean sprouts, green onions and 2% mozzarella cheese. After removing it from the oven, top with fresh torn cilantro. For a heartier pizza with more protein, add cooked chicken or shrimp. Having tasted Elana’s pizza, I can state unequivocally that it is better than anything you can get a Domino’s, Pizza Hut, Ledo’s, Papa John’s, etc. I’m feeling inspired now, I’ll have to make pizza this week! Load up on the onions, mushrooms and peppers, all superfoods, especially where immunity is concerned. Who dosen’t like a pizza with onions and peppers!/? Oh how I miss your fabulously healthy and delicious Sunday night pizzas!!! We LOVE homemade pizza. Whenever I order pizza out, I remember how much better it tastes when it’s homemade!